Jeff Brohm thought long and hard about returning home to rebuild his alma mater’s football team. Turns out, the timing was off. Besides, he was happy building Purdue’s program. One day after reportedly meeting with Louisville officials in central Indiana (Wednesday, November 28), Brohm informed Boilermakers athletic director Mike Bobinski he was turning down the Cardinals job so he could stay in West Lafayette. For the Boilermakers, it’s another major victory. Purdue has now fended off two significant offers from two Power Five conferences over the past 11 months to retain Brohm. 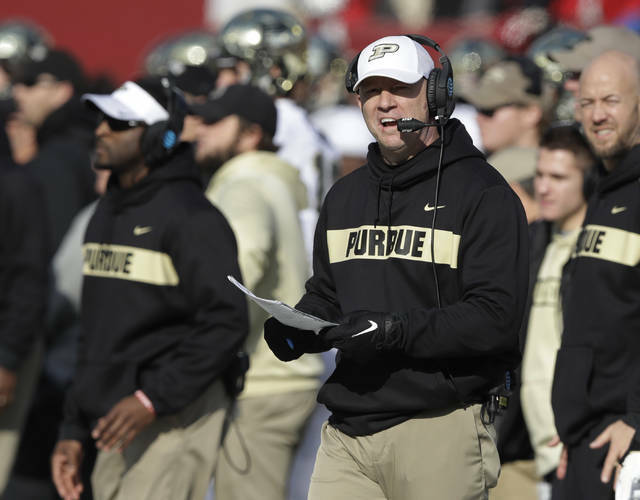 And it probably won’t be the last time the Boilermakers face such a battle for the 47-year-old Brohm, who is considered one of the bright young coaching minds in college football. It’s taken him only two seasons to turn the Boilermakers from a floundering program into one on the rise, going 13-12 with back-to-back bowl bids for the first time in 2011-12. Tennessee offered Brohm its job last winter, but Bobinski won that round by giving Brohm a pay raise and a contract extension. When Louisville fired Bobby Petrino 2½ weeks ago, Cardinals fans began clamoring for the hometown kid and former Louisville star quarterback to return. Brohm was peppered with questions at his weekly news conference the following day, later that week after another report surfaced that he was taking the Louisville job and again after each of the Boilermakers’ final two regular-season games — a triple-overtime loss to Wisconsin and Saturday’s victory over rival Indiana to retain the Old Oaken Bucket and become bowl-eligible. All along, Brohm downplayed the probability of his departure from a school dubbed the Cradle of Quarterbacks. In five seasons as a head coach, Brohm’s teams have reached the postseason all five times. He is 43-22 overall. But this past season may have been his most impressive. After Purdue started 0-3, Brohm’s play-calling became more aggressive. The result: Purdue won four straight to get back in the postseason mix and finished the regular season with three victories over Top 25 foes — Boston College, Iowa and Ohio State — for the first time in 15 years. The 29-point rout over then-No. 2 Ohio State was one of this season’s most stunning upsets. Still, the Boilermakers had to beat the rival Hoosiers in Saturday’s regular-season finale to become bowl-eligible. Now, after the 28-21 victory, Purdue (6-6, 5-4 Big Ten) is waiting to find out who and where it will play next. What they now know is Brohm will be leading them onto the field. For the Cardinals, it’s a bitter disappointment. Louisville athletic director Vince Tyra appeared to acknowledge Brohm was his top option during an interview last weekend. The two reportedly met Tuesday and Brohm spent most of Wednesday on Purdue’s campus debating whether to accept the job. It’s unclear where the Cardinals will turn next, though some have speculated Troy coach Neal Brown, Appalachian State coach Scott Satterfield and Cincinnati coach Luke Fickell could be on the list. Brohm’s announcement came shortly after Big Ten officials announced fifth-year senior David Blough was named the third-team all-conference quarterback by the media and Purdue’s star receiver Rondale Moore was named the conference’s freshman of the year. Moore grew up in New Albany, Indiana, just across the river from Kentucky, and played at Louisville Trinity, the high school Brohm attended. He now becomes the foundation for Brohm’s next chapter at Purdue.